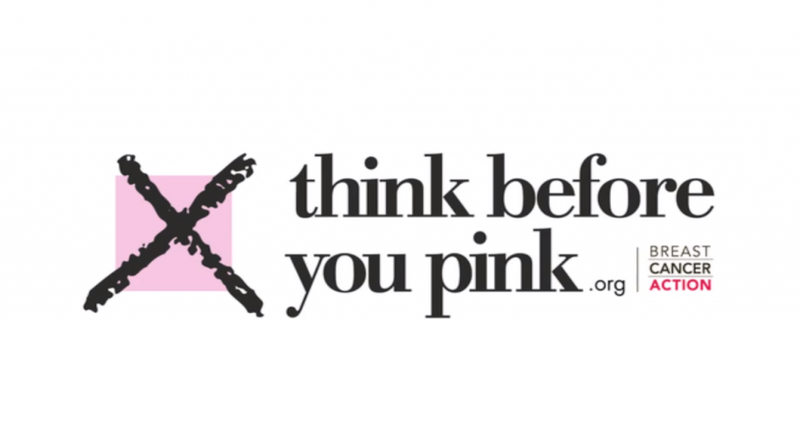 Think Before you Pink! | Indestructible Ideas! When you think of breast cancer it is likely that you get a flurry of pink ribbon images at the same time. The reason is that the pink ribbon is the international symbol for breast cancer awareness and is utilized by individuals all the way up to major companies. Maybe your first thought is, “aww how great, I want to buy that pink ribbon product, it goes to breast cancer cures!” After all, how could you even question such campaigns, it would be insensitive to those struggling with cancer? But more than ever, we need to start questioning, we can no longer blindly support these pink ribbon campaigns because there is a chance that you are being duped by a “Pinkwasher” and doing more damage in the long run. So, before you jump on that pink ribbon wagon, think. A Pinkwasher is a company or organization that claims to care about breast cancer by promoting a pink ribbon product, but at the same time produces, manufactures and/or sells products that are linked to the disease. EXAMPLE: In 2010, Dansko Shoe Company sold pink ribbon clogs and those buying it thought that a portion of their purchase of pink ribbon clogs went to a breast cancer program. However, purchase of the pink ribbon clogs was not connected to Dansko’s donation—none of the portion of the sales went toward their already set donation of $25,000 to Susan G. Komen for the Cure. No matter whether or not you bought the clogs, their donation was the same. EXAMPLE: The KISSES for a Cure music box is advertised by The Bradford Exchange that says: “A portion of the proceeds from this music box will be donated to help fight breast cancer.” It is not clear what breast cancer organizations would benefit, how much money they would receive, and what programs or work would be funded by the donation. Is there a “cap” on the amount the company will donate? Has this maximum donation already been met? Can you tell? EXAMPLE: In 2010, Reebok marketed a line of pink ribbon footwear and apparel at prices ranging from $50 to $100. They promoted the fact that some of their pink ribbon product sales would be donated to the Avon Breast Cancer Crusade, they set a limit of $750,000, regardless of how many items were sold, and there was no mechanism in place to alert consumers once the maximum donation had been met. If you or a loved one has cancer, or let alone is asked to donate or participate in a Pink Ribbon campaign, ask these questions. We are making a short documentary on cancer and Think Before you Pink project has inspired me to look at cancer through a different lens. This type of action will force these campaigns to become more transparent and accountable and help transform this cancer culture into something more beneficial and healthy. ← Framing the Future for the 99%!